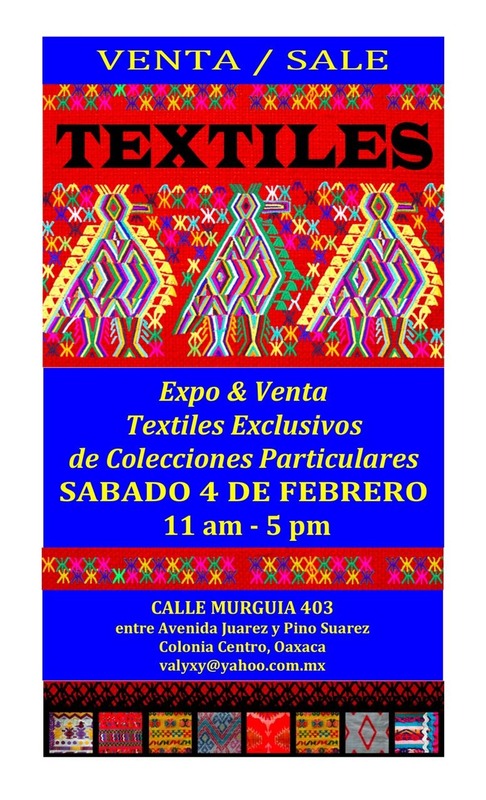 If you are in Oaxaca on February 4, 2012, don’t miss this spectacular sale of collectible textiles. Several well-known Norteñas who have lived in Oaxaca for many years are downsizing and editing their collections, including Mary Jane Gagnier who is a book author and formerly married to weaver Arnulfo Mendoza. If I wasn’t going to Chiapas this week, I’d be there in a heartbeat. I suspect there will be huipiles woven on blackstrap looms with the designs integrated into the weft. Some will be embellished with needlepoint. There will likely be shawls, scartable perhaps table linens. Enjoy. This entry was posted in Oaxaca rug weaving and natural dyes, Textiles, Tapestries & Weaving, Travel & Tourism and tagged art, blackstrap loom, blogsherpa, clothing, dresses, fiber, huipiles, Mexico, Oaxaca, scarves, shawl, textiles, weaving. Bookmark the permalink. Thanks for the information, but exactly where the sale take place? Also, what are the hours? http://wp.me/p1v1Ek-23n Click on this link for poster with all the details. Thanks for following. Sorry, my first upload didn’t work. P.S. Would love to meet up the next time you’re in the city. A chat over a bowl of chocolatl would be great! http://wp.me/p1v1Ek-23n Here’s the link to information about the sale. The Jalatlaco posada is Hostal del Barrio on Privada Noche Triste. I have contact info in the blog post I just wrote about Where to Stay in Oaxaca. Where is the sale? V. interested and am in Oaxaca now. http://wp.me/p1v1Ek-23n Click on this link for complete details — address and email contact information.